The mean streets of Chicago have claimed many innocent lives but on Monday, it was the truth that got gunned down in a Cook County courtroom. The only music Empire actor Jussie Smollett, who had been indicted on 16 felony counts of disorderly conduct by a grand jury, will be facing is at whatever club he visits to celebrate getting away with his criminal actions as the actor only had to forfeit his $10,000 bond and spend two days at Jesse Jackson’s office. And the cherry on top? Smollett’s case was sealed, an act that was not so much a sanitizing of a crime but a Stalinizing of truth. To clarify: Smollett did not accept a plea deal, whereby he admitted guilt and accepted a milder punishment for actions that diverted law enforcement resources and personnel into chasing “phantom klansmen,” smearing the President of the United States and his supporters, and generating racial friction throughout the country by promulgating his unconvincing faux-racial/homophobic attack on national television. So why did the prosecutors drop all the charges? So they didn’t say Smollett was innocent, but indirectly communicated through weasel words that he suffered enough and “made things right”. Besides the prosecutors didn’t need to say he was innocent; Smollett was more than happy enough to do that for them while taking selfies outside the courthouse. 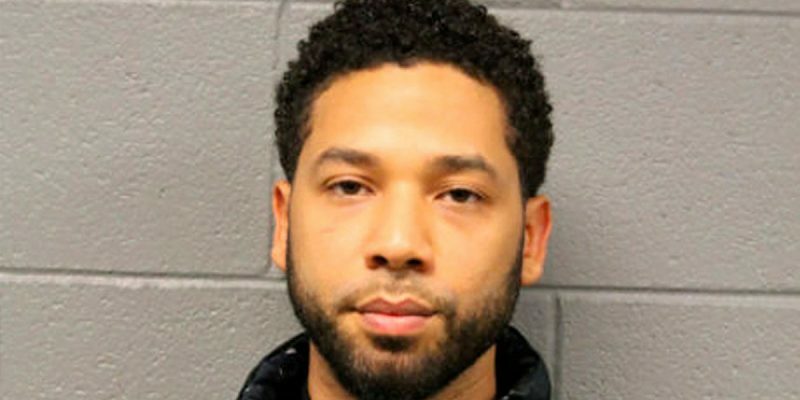 In an amazingly brazen act, Smollett has quadrupled-down to the tenth power about his innocence despite a mountain of evidence and witness testimony implicating him in the staged beatdown by MAGA hat-wearing Trump supporters curiously wandering around Chicago on a freezing January night with a noose and container of bleach. It is a self-indictment of his character and by extension an incrimination of anyone who stands by the small-time actor, big-time unconvincing con-artist. Smollett and his apologists, both paid professionals and volunteer morons, mock not only the intelligence of society but the departed, the victims who lost their lives in vicious lynchings. People like James Byrd, Jr. who was dragged to death in Jasper, Texas by white supremacists. Hate crime legislation was enacted into law to protect lives and liberty, not to be exploited as a political theater stage for a self-absorbed bit-part actor trying to grab more money and attain fame that he could not achieve through his talent. And the Smollett sham underscores precisely why there was reluctance by elected officials to support hate crime legislation fearing it would become a legal weapon used by those in power to crack down on political opponents and not equally applied in all instances where race was the motivating factor in the commission of a particular crime. The Smollett case is beyond a miscarriage of justice; it’s a mile-marker on the expressway to a place where political identity matters more than facts, where privilege trumps process. Watching some leftists on social media gingerly walk back their previous condemnation of Smollett’s stunt has been disheartening, an indication that facts and evidence are considered on a partisan case by case basis and not by merit. And it also implies that the mob mentality has cowed even Democrats. There is no truth, only conforming to the “safe side” of the picket line. We have gone far beyond the point of no longer even being able to stand in the same room with each other and are approaching a dark place where we can’t even agree what up is and what down is. When general consensus can no longer be reached on what ought to be self-evident, elections devolve into ideological gang fights. There is no truth, only sides. America’s most underrated patriot and Founding Father John Adams understood this when at great risk to his standing (and his livelihood if not life) chose to defend in court the British soldiers who participated in the Boston Massacre. When the attack on Smollett was dumped to the public curb, the media breathlessly and histrionically pinned the alleged “lynching” of Smollett on Donald Trump’s America. What has transpired is an arrogant and brazen exercise of celebrity privilege and power in Obama’s Cook County.